11.22.07 Colin Michael (a.k.a. 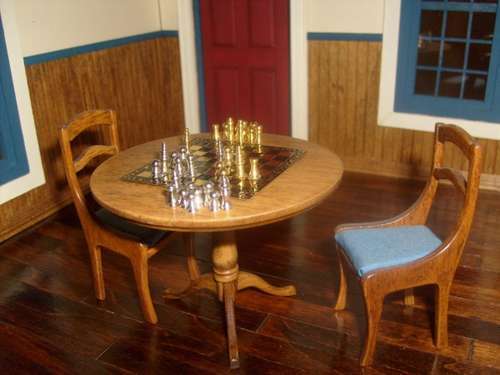 the "Maine Yankee") of Dresden, Maine is passionate about all things miniature. 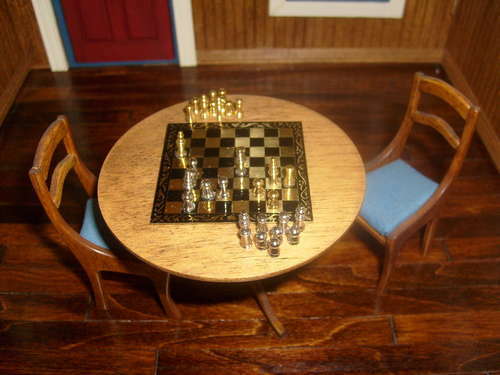 As a skilled miniature craftsman, he has created countless scale model projects including furniture, rooms and complete houses that are as fascinating as they are beautiful. 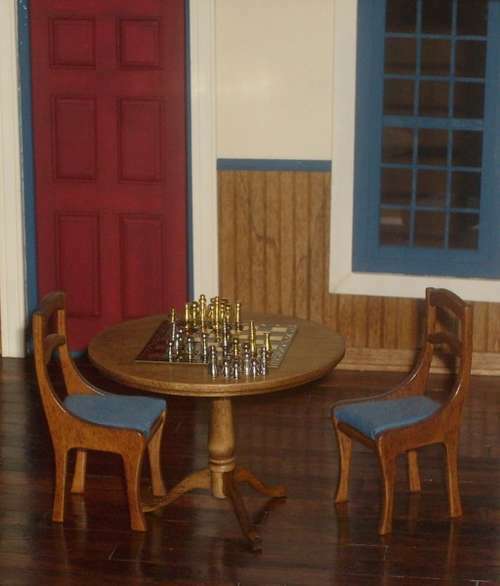 What really caught our eye though was a position from a Bobby Fischer game on a miniature set with a 3/8 inch king displayed on a 3 1/2 inch diameter Hepplewhite table with two matching chairs and upholstered seats all within an Early American period Captain's Study. A position from a Fischer game in 1957 represented on a board just under two inches square in the scale of 1 inch = 1 foot. My father bought me a chess set when I was ten and taught me to play. He was proficient, but no great player, so it was not too long before we could play on par with each other, which was encouraging to me. In junior high, I was in the chess club and played in the middle of the pack. I was never very competitive, but I always enjoyed learning about famous games and playing through the moves from matches. This evolved into a love of chess sets for some odd reason, and I started collecting them. In high school, I collected enough Avon pieces to make a complete set (it helped that my mother was my Avon lady). I purchased tiny sets, wood sets, metal sets, etc. I bought the complete Franklin Mint Civil War set, I picked up a quartz set with a marble board in the Virgin Islands, and found the most interesting marine-life set made of soapstone while stationed in San Diego with the Navy. In recent years, I have played against the computer a bit, but have lost interest generally. I still enjoy reading about games and famous matches. I'm still not a very good player. I've let most of my collection of sets go, but still have the Avon set and the marine-life set kicking around in boxes. I've taught my son to play, but he is a bit too impatient for the game. He is aggressive, but falls into traps. When I made the setting for the miniatures "Make" (held by the All Things Mini website: AllThingsMini.com) I wanted to set the board up at a critical point in the game. I thought of using a "famous" game, but liked the layout of this one because it seems to show opponents who are playing with noticeably different styles. I also wanted only a few pieces on the board so that even chess novices could see what was about to happen. Unfortunately, all that Fisher says about the game (from his book Bobby Fischer Teaches Chess) is that it is from an actual game of his. No mention of opponent or time frame. Well, we did some research and discovered that the position on the board is from the game Milton Otteson vs. Robert James Fischer played on July 5, 1957 in the Venetian Room of the Astor Hotel in Milwaukee, Wisconsin as part of the New Western Open tournament. The position appears after Fischer's thirty-fifth move 35...Kf7. For posterity, here is the complete game, one that Fischer loses. For more information on Colin's projects please visit his blog here. I'm a visual artist and I'm most impressed by your work. Thanks for showing it on this site.